This is a common scenario, particularly with the lower complete denture which are commonly loose during eating and uncomfortable. Lifestyle can be negatively impacted upon by having a poor lower denture, and this problem is made worse if there is advanced bone shrinkage which is associated with poor mouth muscle coordination and speech / chewing difficulties. After identifying and correcting deficiencies in a lower complete denture, 2 or more dental implant may be used to enhance the stability, retention and support of a lower complete denture. Conventional dentures are held in by the suction, utilising undercuts, clasps and have some degree of movement. 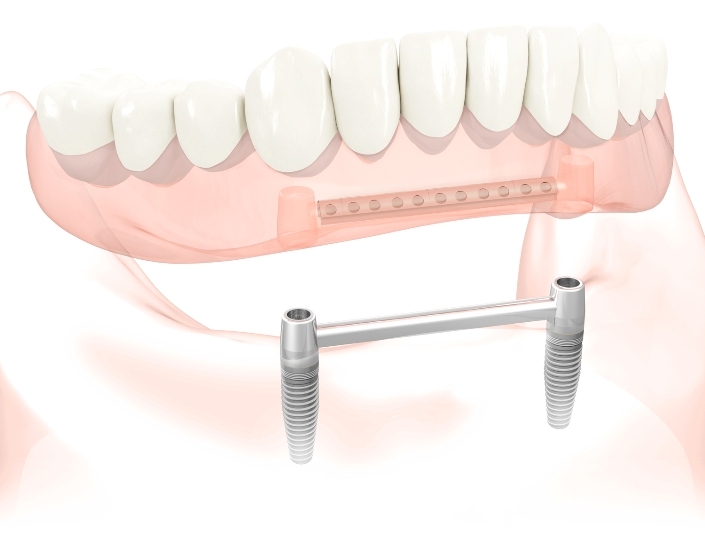 Implant supported / retained dentures (dentures attached to implants) overcome the disadvantage of the psychological impact of a “removable prosthesis” moving about in the mouth during normal daily activities and offer greater advantages to the patient in terms of chewing, speech, looks, confidence etc. Implant placement is generally less technically demanding too.